12 assorted flowers made from paper embedded with wildflower seeds in shades of blues, aquas, greens and white. The flowers measure between 1 ¾” and 3 ½” in size and are on wired stems. Each bouquet will arrive wrapped in kraft paper. The seeded paper contains the following annual and perennial seeds: Catchfly, Clarkia, Snapdragon, Sweet Alyssum, English Daisy, Black-eyed Susan and Bird's Eye. 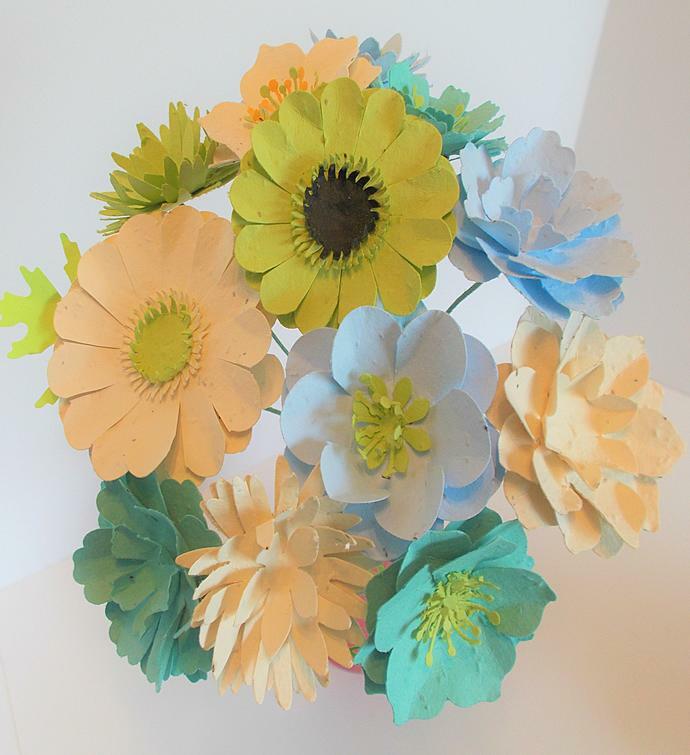 12 assorted flowers in shades of blue, aqua, green and white on wired stems that measure between 11 ¾” and 3 ½” in size. Bouquet arrives wrapped in kraft paper.